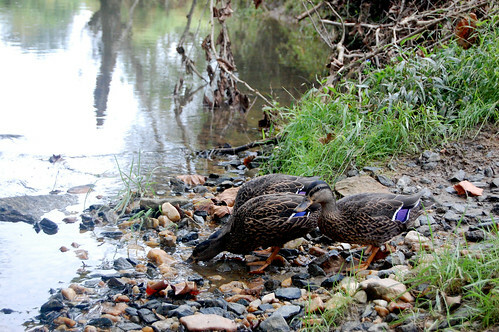 Last week marked a milestone for our ducks. We let them in on the big secret we've been keeping from them. I have to confess I was a little bit nervous. I was worried that if we let them know what they've been missing, they might never come home again. They might find that this new discovery was much better than the bits of dry duck mash and the large black tub that they soak in. 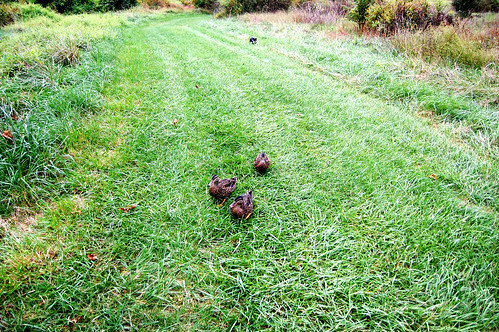 But sometimes, a mama duck (that's me, I'm their mama) has to let her ducklings taste a little freedom. So we headed down to the stream. We called to them and they waddled behind us, keeping up for the whole, long trip. We almost lost them a few times, to the tasty fox tails and bits of bugs in the grass. But they always caught up. And once we turned that final corner, they knew exactly what to do. It was almost as if they didn't believe it. 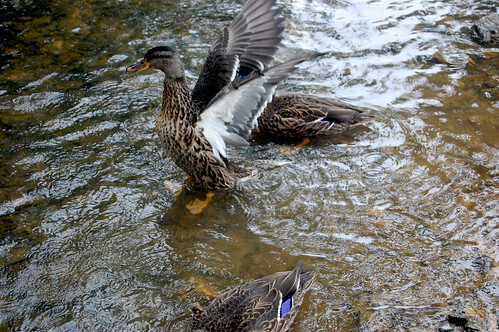 They got in timidly at first, but it wasn't long before they were ducking their heads, splashing water onto their backs, sitting high in the water and flapping wings wildly, darting underwater and searching for bits of green and slime. I stood back and looked at the scene before me. My three girls wading and swimming–in various stages of "birthday suit-ness". Dripping clothes hanging from tree branches on the shore–the "laundry" they were drying. My dogs swimming back and forth into the deepest water, chasing after sticks. 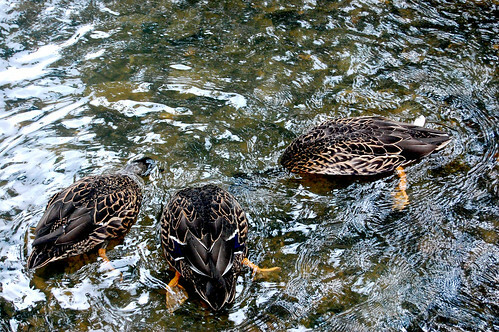 And my three ducks wading right in the middle of all the action. Each minding their own business. Each completely happy. I was a proud mama duck. And the best part? Once we decided it was time to go home, we gathered up the clothes and the boots and headed back up the trail. And I called once more to the ducks, just in case they still wanted to come home. And (much more quickly and obediently than my own children) they waddled out of the stream and back up the trail behind us. 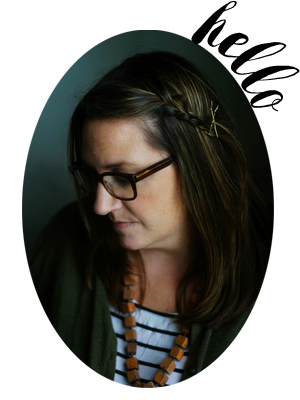 Molly, you write special posts time after time, but this one is mother perfection. What a glorious moment for you, hope you soaked (no pun intended) all that love that was coming full circle as you watched. Motherhood=risky business! Aww! I am glad they came home with you! I just love those water shots! What an adorable image of all those babies splashing around! adorable. i love that they followed you back home. FANTASTIC little story! I can just picture them waddling after you…So sweet! Thank you so much for sharing. So great. I’m impressed you trusted them and they came home so willingly. Things to remember. That was a great post. I especially love the pic of your dog and one of the ducks. How cute. oh my gosh!! that last picture with ruby is priceless!!! we wanted to come by this weekend but things just got busy–maybe the weather will hold and we can stop by this week! does emma have a game this week? 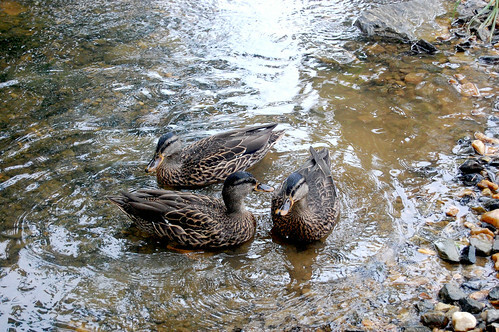 It’s your bird loving sister Lauren.I loved this post!Before you were born,I hatched out some baby mallards in our old incubator, and they all followed me everywhere and went swimming in our wading pool before I let them go.So this brings back memories…It looks like some of them might turn out to be drakes,although I could be wrong. 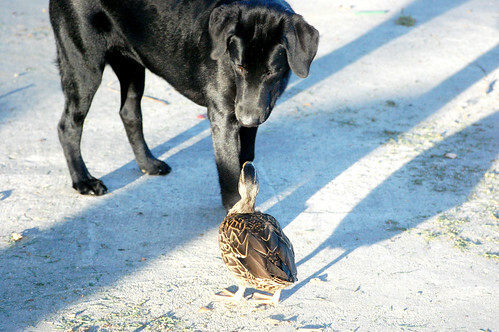 tamra and katie–what you didn’t see in that picture is that the duck kept snapping ruby on the nose. it was so funny. This duck is definitely in charge. How exciting, the ducks are gorgeous. I just found your blog and look forward to reading some more. Your words are such a joy to read. Hooray! I love this post. Your ducks are so beautiful! I’ve had ducks, and this post really makes me miss them. Beautiful.